There is one thing the modern, style-conscious male should never underestimate: the power of an accessory. Whilst the majority consider accessories inferior to jackets, shirts or trousers, they are in fact one of the most important weapons in a man’s fashion arsenal. Not only can they inject any outfit with a touch of individuality, but their versatility means they can be used within a wide variety of looks, too. Whether it’s a bold pocket square brightening up a dull-looking jacket, or a backpack to carry your daily essentials, a well developed accessory collection forms the cornerstone of any successful autumn/winter wardrobe. Once viewed as a convenient item to carry your necessary tools to and from work/college, the bag has gone on to establish itself as a key part of any capsule wardrobe. First up, a style that was an instant hit during the AW13 showcases at London Collections: MEN. The document holder (sometimes known as ‘the pouch’), as the name suggests, is not only ideal for carrying your work documents and pocket-sized essentials, but its slim silhouette makes it extremely practical. If your day consists of endless commutes and you aren’t a fan of lugging around heavy baggage, this is the ideal companion for you. It’s worth mentioning – due to its sophisticated and sleek nature – this type of bag is best paired with your smartest attire. A slim-fitting suit would be perfect; as would a button-down shirt, chinos and blazer combination. When considering design, be sure to pick one that best suits your personality and style. If you like to stand out from the crowd, take a look at a printed option, such as Givenchy’s sought-after ‘Doberman’ version. Alternatively, if you are a more reserved/refined dresser, a classic leather version, similar to those currently available at Reiss, would make a versatile and timeless choice. If you are a man who carries around a lot of belongings daily, then the document holder is probably not for you. Instead, consider bag trend number two: the backpack. No longer just for kids in the playground, this versatile and durable style of bag has developed into a practical essential for the modern gent. But, whilst the shape has remained the same for AW13, the styles have altered somewhat. This year’s must-have design comes complete with an attention-grabbing print. Whether you choose Topman’s ‘Sprayground Bullets Deluxe’ offering or Penfield’s camo print option, the trick is to try something new and not be afraid to step out of your comfort zone. However, when all is said and done, if you are not quite ready to make such a statement, keep it simple with a classic pattern, such as the muted floral pocket backpack available at ASOS. Before you go ahead and invest in your new accessory, it is important to consider your current wardrobe. In comparison to the document holder, the printed backpack is best integrated into more casual ensembles; try dark indigo jeans, a button-down shirt, cable knit jumper and a pair of on trend hiking boots. When it comes to head wear this winter, there are two main styles you should be looking to invest in. The first – and perhaps the season’s biggest accessory trend – is the fitted beanie. In terms of styling, the world is your oyster. The hat’s slender silhouette ensures it doesn’t look out of place within smart-casual looks, whilst its relaxed nature means it will slot seamlessly into your current casual wardrobe. If colour is not your ‘thing’, don’t worry, a neutral coloured design would work equally well. If you go down this route, consider a heritage-inspired style – cable knit and marled versions are particularly prevalent this season. If you are the kind of guy who likes to push boundaries and follow high fashion, then consider hat trend number two: the beret. Featured heavily on the AW13 runways at London Collections: MEN, the beret is the latest accessory to try and force its way into the wardrobe of the everyday male. For styling inspiration, look no further than the Agi & Sam and YMC showcases – both paired the accessory with a selection of thick winter tweeds and quilted gilets. However, if this silhouette is a step too far out of your comfort zone, the classic baker boy makes a great alternative. Perhaps its best feature is its versatility; allowing the wearer to integrate it into both smart and casual looks with ease. Try pairing yours with a chunky shawl neck cardigan, chambray shirt, selvedge dark denim and a pair of timeless brown brogues. Whilst shoes are clearly the most important thing to put on your feet, socks can be equally significant. Injecting another texture or pop of colour via your socks helps set your look apart from the crowd – something the majority of men still fail to appreciate. This season it is all about the thick woolly boot sock, which is usually seen peeking out of the top of worker/hiking boots. Not only do they keep your feet cosy, but their thick, textured construction will give your outfits a unique, seasonally-appropriate feel. When considering how to style, look to combine them with clothes that share similar characteristics. For instance, a cable knit jumper and button-down shirt would be fitting for your top half, whilst on the bottom, hiking boots and selvedge denim references their rugged, outdoors appeal. For added style points, and to fully show off your new accessory, we recommend tucking your jeans loosely into them. 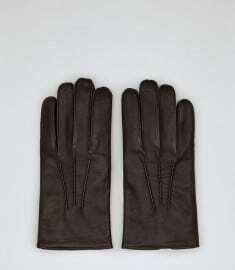 Gloves have forever been a winter wardrobe staple. However, whilst many will favour their trusty knitted/woollen versions, this season it is all about two styles: leather and driving. The former are the most versatile and cold-weather-appropriate, due to their thicker material/construction and ability to be paired with both smart and casual attire. The latter, on the other hand, are generally a lot thinner, which allows for greater levels of dexterity (particularly helpful during the morning commute), but often look best in sophisticated, refined ensembles – think a well-cut suit and elegant overcoat combination. In terms of colour, neutrals will always be a safe bet and guarantee never to fall out of style. Yet slightly bolder hues such as burgundy, olive green and camel make a refined and subtle statement that can be just what you need to stand out from the crowd. Whilst ties have, of course, always been an essential formal accessory, this year we are seeing a change in materials. Predictable cotton and silk designs are being replaced by heavier fabrics such as wool, cord and flannel. These rugged textures suit the season perfectly, and allow the wearer to integrate them within a range of different outfits, from smart-casual to formal. If a dressed-down look is what you desire, opt for one of the many wool designs now available and pair it with a button-down denim shirt, dark coloured trousers, a textured tweed jacket and brogues. For something far smarter, choose a checked flannel tie and match with a slim-cut suit and solid shirt. Although the pocket square is nothing new, its popularity has certainly exploded over the past few years. So it comes as no surprise that brands have hundreds of options for us to choose from this AW13. Key styles to seek out this year are bold, patterned versions that reference current key print trends – think florals, checks, Aztec/ornate, camouflage and herringbone. Don’t match the colour of your pocket square to your tie – this looks a bit too stiff. Instead, try and pick out a colour in the shirt or tie you are going to wear. This links your whole outfit together and shows you pay attention to the details. For beginners pattern mixing, make sure both the size and the pattern of your tie and pocket square are different. For example, a small polka dot print tie with a paisley pocket square. For more tips and foolproof approaches, make sure you check out our previous guides on pocket squares and pattern mixing. Hopefully this brief guide has given you an idea of what accessories you should be looking out for this season, and how you can use them to give an added touch of style to an otherwise ordinary outfit.